I think I will get a little flack from this, but I’m feeling the need to blow the whistle on a life insurance product that is still being pushed by a lot of insurance agents out there. I can find some positives in just about every kind of life insurance product, but right now, this is one that makes no financial sense. In the past, this product design had some merit for some people and I have seen it work and sold it myself. New insurance regulatory changes in actuarial guidelines have come through that make this product perform poorly. Today, this product only makes up about 2% of term insurance that is sold, but I think it would be much less if the consumer knew the math behind it. First, let’s examine why a consumer would find it desirable enough to buy. In simple terms, loss aversion is the reason. When we hear the salesman say “How’d you like to buy an insurance policy that gives you back all your premiums if you don’t die?,” it’s like music to the ears. Naturally, this seems like a good deal and if the price is palatable, it could seem like the way to go. That’s only if you didn’t have the rest of the story. In a way, the sales line above is illustrative of the kind of doublespeak that gives life insurance salesmen a bad name. Let’s see the numbers first and then we’ll adjust the sales pitch a little and see how it sounds. A 35 year old male can buy a $1,000,000 20 year level term policy at “Preferred” for about $600 per year. A Return of Premium product would be about $2,500 per year. At the end of 20 years, the entire $50,000 that was spent over that time would be returned to the policy owner. But, if we invest the $1,900 per year difference, we only have to earn a 2.8% return over 20 years to create the $50,000. If we achieve an 8% return with the same $1,900 per year over 20 years, we end up with $86,000. So what is the opportunity cost? On the surface, it looks like the opportunity cost is $36,000. But, that isn’t the whole story. In a ROP product, you have to make it to the end of the policy to get all your money back. So, if you change bank accounts and your policy lapses, then you’re just screwed out of most or all the money you put in there. You cannot actually calculate the opportunity cost of buying this type of policy, but it’s greater than just the interest rate difference. Some might argue that the return in these kind of policies is guaranteed, unlike stock market returns. This is true, but most who are buying this are in the younger ages and can take on the risk. 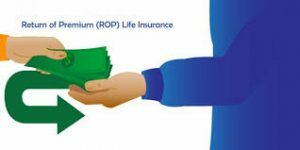 Even those who are skeptical about the stock market can outdo the ROP’s guarantees with annuities from the same company that is selling the insurance policy. I ran several scenarios and was able to find a few age/rate classes that could get the return into the low 3% range, over 20 and 30 years. Many were in the mid 2% ranges. I can’t see how inflation rate returns could ever be worth tying up any amount of money for that length of time. Here’s the adjusted sales pitch.